Independent and TUV accredited consultancy firm Ecomatters executed a quantitative assessment on the sustainability of the CO2 footprint of LoW8 composite cylinders. The outcome is not surprising but still beneficial for both the environment and your total costs of ownership. This is what we call a win-win situation! 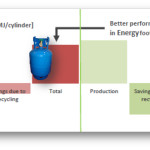 Ecomatters looked at both the Life Cycle Assessment (LCA) as well as the Eco Efficiency Analysis (EEA). The Customer Benefit Model (CBM) reveals what the actual costs of ownership are when using a LoW8 cylinder. Please go to the Specifications tab to learn how you can save money. The very efficient production process, which does not need any heating or cooling cycles is completely emission free and results in an energy reduction of over 80% compared to a steel or conventional composite technology. 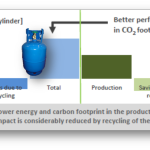 The results from Ecomatters quantify what most experts already knew: the LoW8 technology is the most environmental friendly technology for storing and transporting compressed gasses. By far.